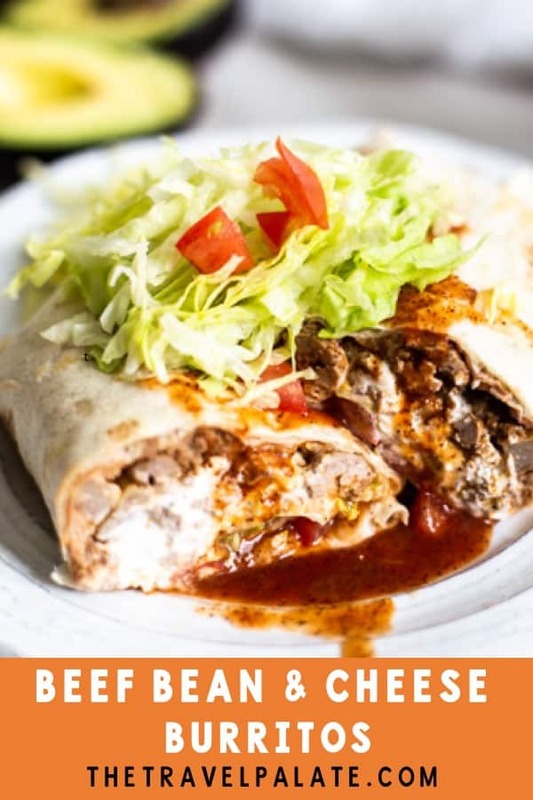 This Beef Burrito Recipe is a delicious and easy weeknight dinner that satisfies all your Tex-Mex cravings! If you love Ground Beef Tacos, then you’re going to enjoy these Beef Burritos too because they use the same taco meat as the filling. One of my favorite things to do at the beginning of the week is make a double recipe of Ground Beef Tacos so I have plenty of leftovers to make some delicious Tex Mex dinners all week! One of those is this Beef Burrito Recipe! This dinner comes together quickly, so it’s a great time saver. I know there are cooks who love to spend a long time in the kitchen, but that’s not me! I’m usually tying to throw something together between work and my daughter’s sports schedule. If this sounds like you-read on! I’ll assume you already have some left over Ground Beef Taco meat heating up in the microwave. Have all of the your add-ins prepped and ready to go before you warm up the tortillas. By the way, I prefer warming my tortilla up on the stove in a skillet or griddle pan rather than the microwave. I just like the little bit of browning that happens there. But if you don’t mind using the microwave, then by all means use it. Once the tortillas are hot, put them in a clean kitchen towel to keep them warm. Now you’re ready to make the burritos. Set a tortilla on plate and start layering on the ingredients. 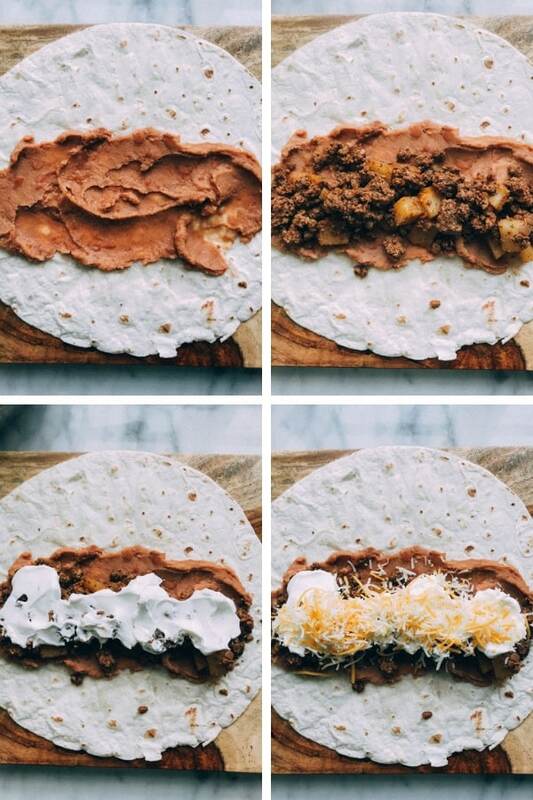 I start with refried beans, then the taco meat, cheese…just keep going with whatever else you want in there. Keep layering on the goodness! These really are super simple and yummy! Sometimes I will wrap them in foil to keep them warm-other times I drizzle some Taco Sauce over them and eat them with a fork and knife. Beef Burritos are a delicious and easy weeknight dinner that satisfies all your Tex-Mex cravings! If you love Ground Beef Tacos, then you’re going to enjoy these Beef Burritos too because they use the same taco meat as the filling. 1 16 oz package shredded cheese; use your favorite kind! We like Mexican cheese blend. Prepare Ground Beef Taco meat and keep warm over low heat. Empty refried beans into a small saucepan and heat over medium. Or, heat beans is a microwave safe bowl until hot. Prepare any add-ins and have them near your work area. Heat the tortillas over a hot skillet or griddle. Remove from heat and keep them warm in a clean kitchen towel. Place one tortilla on a plate. Smooth 2-3 tablespoons of refried beans in the center. Add about ⅓ cup taco meat on top of the beans. Sprinkle about ¼ cup shredded cheese over the taco meat. Continue layering your desired add-ins. 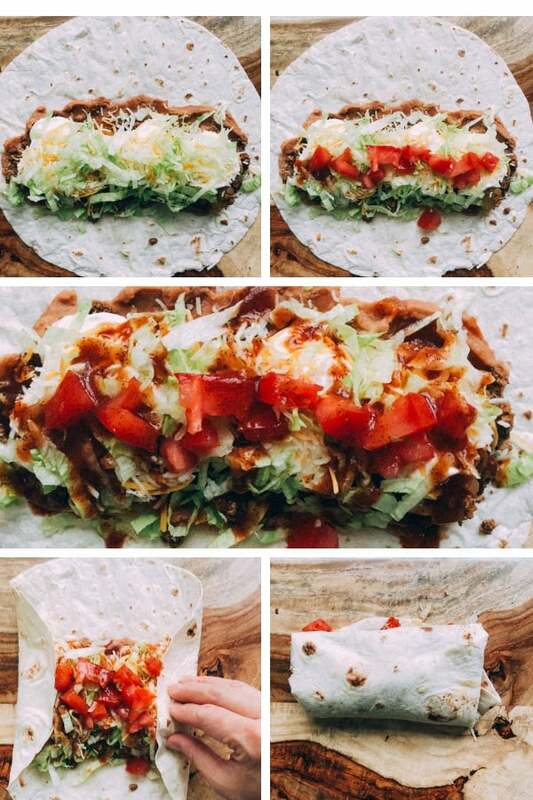 Wrap tortilla up, then drizzle with more Mild Taco Sauce that’s been warmed up. Nutrition information is an estimate and doesn’t include add-ins. 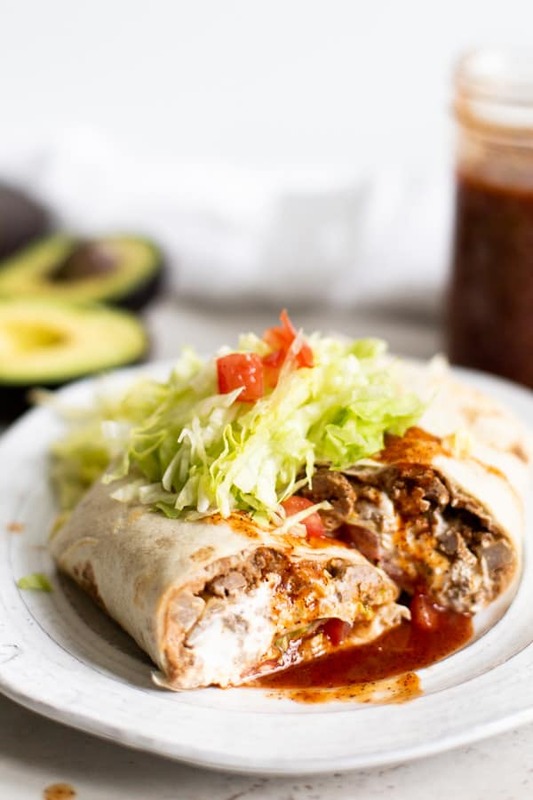 If you made this Beef Burrito Recipe, or any other recipe on the blog, don’t forget to leave a rating and a comment below. I love hearing from my readers! You can also find me on Facebook, Instagram and Pinterest! Oh this just looks and sounds delicious! 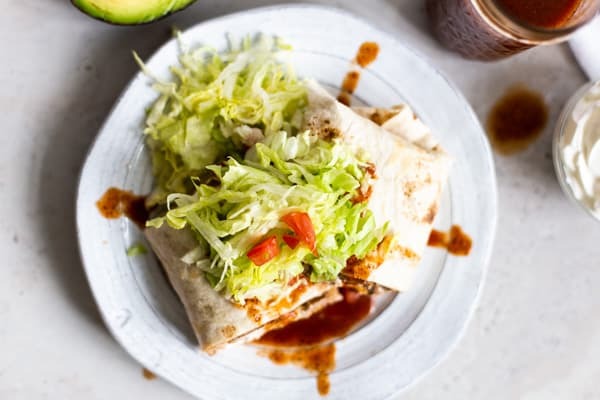 Absolutely delicious recipe – agreed on how quick and delicious the burritos are to make and how delicious they can be. A superb recipe indeed. Saved! Your beef burritos look scrumptious and such a good way to use up beef taco meat. I also love burritos with lots of other filling ingredients. Yum! Oh goodness, burritos are my downfall. I love a good juicy burrito packed full of goodness like this one. Looks delicious! I can’t say no to a couple of beef burritos with all the trimmings. This looks so delicious and I agree that burritos are quick and easy when you’ve made up a batch of ground beef taco meat beforehand.